The NIST article about WWVH was very interesting and informative. It reminded me that lately WWV’s broadcast on 25 MHz has been received from time to time here in southern Arizona. I emailed a report and recording to NIST in late June and received a QSL (images above). I don’t know the status of the 25 MHz frequency. In 2017 NIST was soliciting reports but I haven’t found any current details on the web. Thanks for sharing this, Richard. I’m under the impression that the 25 MHz frequency is still in use, though I may be wrong. 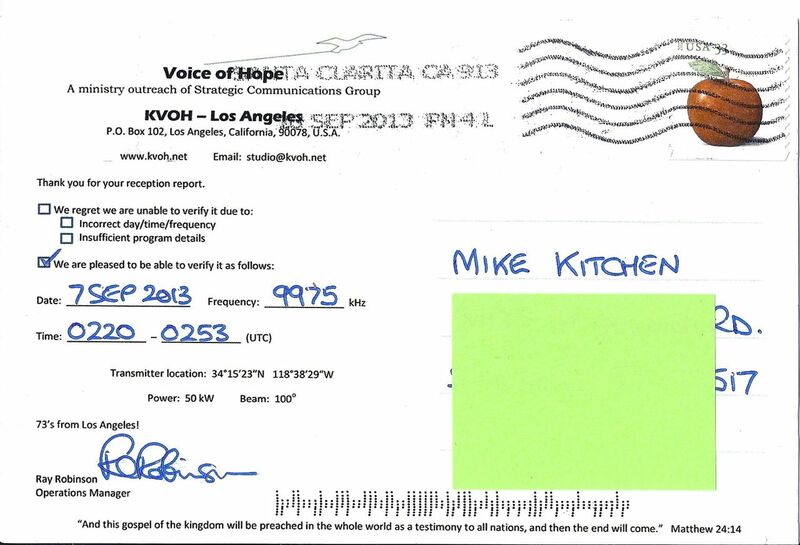 This is also a great reminder–many don’t realize–that WWV does issue QSL cards! 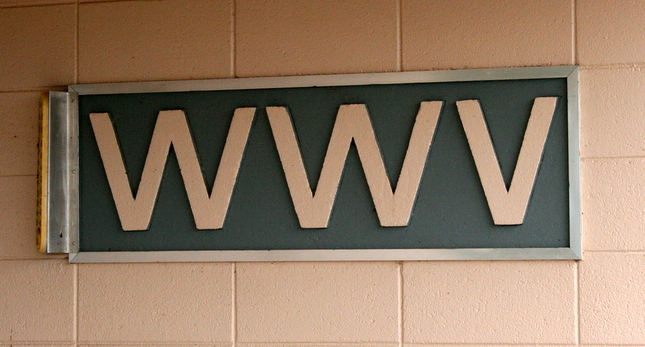 Of course, as we’ve mentioned in a previous post, if the FY2019 presidential budget proposal is accepted/approved, WWV will be no more. 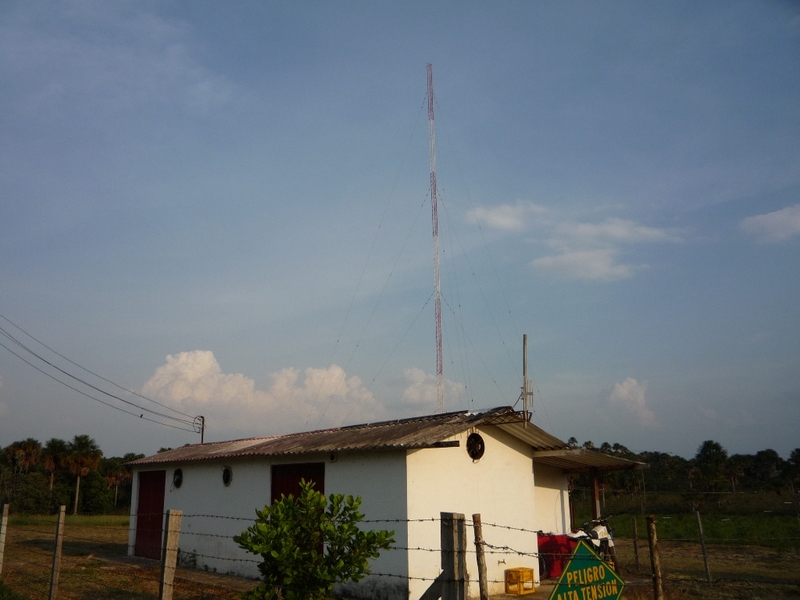 This entry was posted in News, QSL Gallery, Shortwave Radio and tagged NIST, QSL Card, QSL Card Gallery, QSL Gallery, Richard Schreiber (KE7KRF), WWV on August 16, 2018 by Thomas. Front of RHC QSL card (click to enlarge). This was the day the US Embassy in Cuba was officially re-opened. Back of RHC QSL card (click to enlarge). Card was received on April 18 , 2016. Very cool! Thank you for sharing this card and noting that relevant bit of history, Daniel. 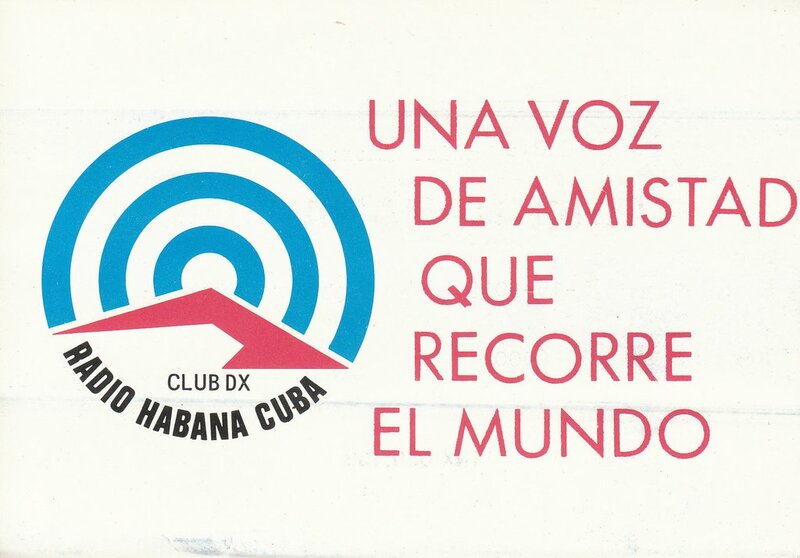 This entry was posted in Broadcasters, News, QSL Gallery, Radio History and tagged QSL Card, QSL Card Gallery, Radio Hava Cuba QSL, Radio Havana Cuba, rhc, RHC QSL on April 26, 2016 by Thomas. 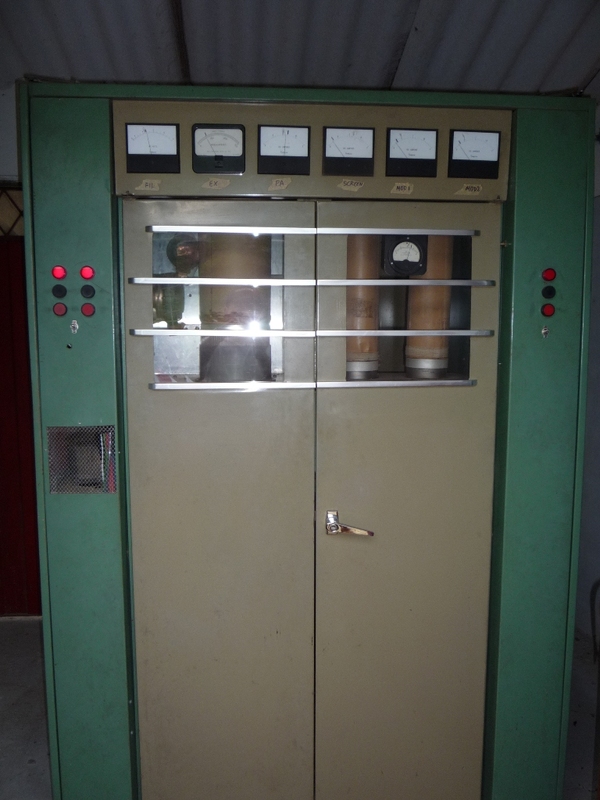 I must have first heard WWV shortly after putting together the Knight-Kit Span Master I received for Christmas 1963. 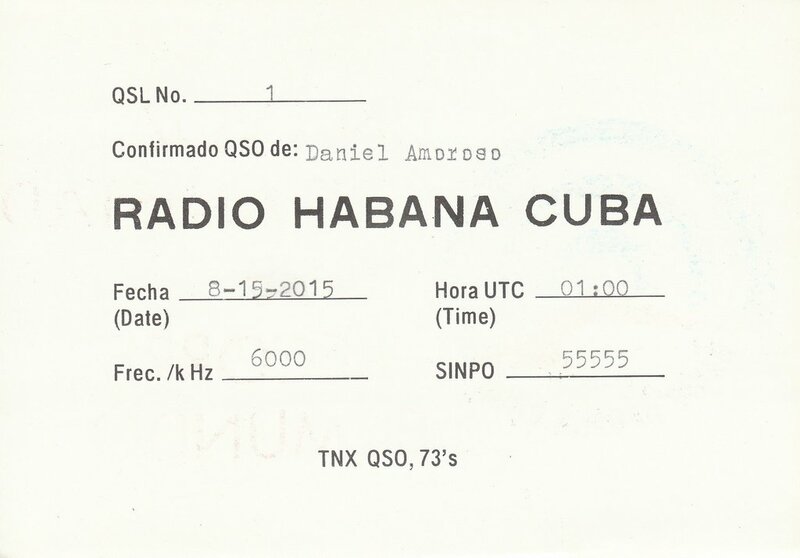 I still have my log books from my high school days, which include an entry for Radio Habana on 29 December 1963 for which I subsequently received a QSL card. But I guess I didn’t log all my receptions. 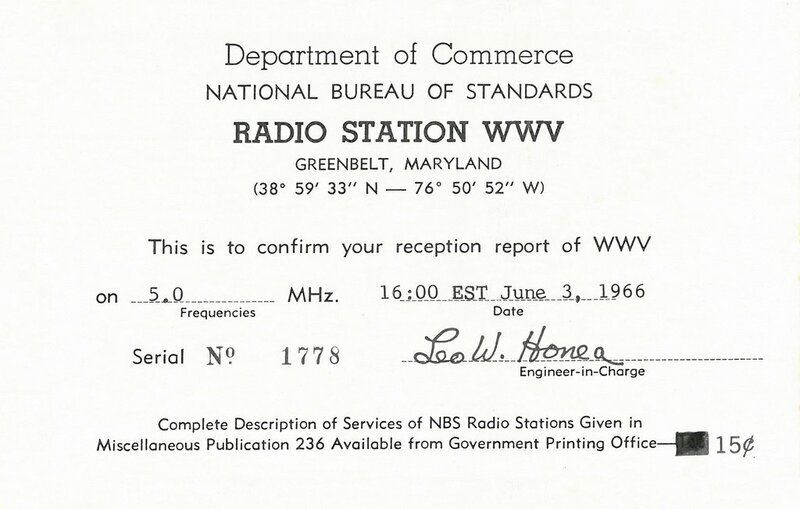 The first entry for WWV is dated 3 June 1966 in the last year of WWV’s operation from Greenbelt, Maryland (on government land that subsequently became the site of NASA’s Goddard Space Flight Center). 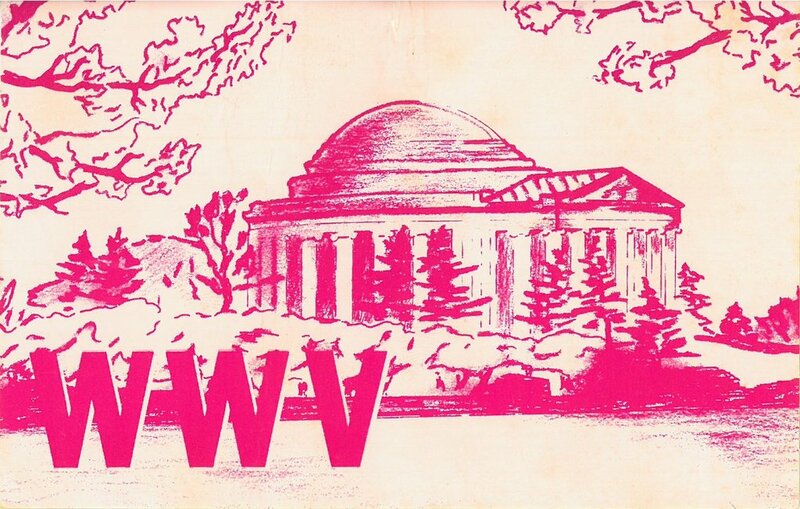 I have a QSL card for the reception of the 5 MHz signal featuring a drawing (in pink) of the Jefferson Memorial [see above]. 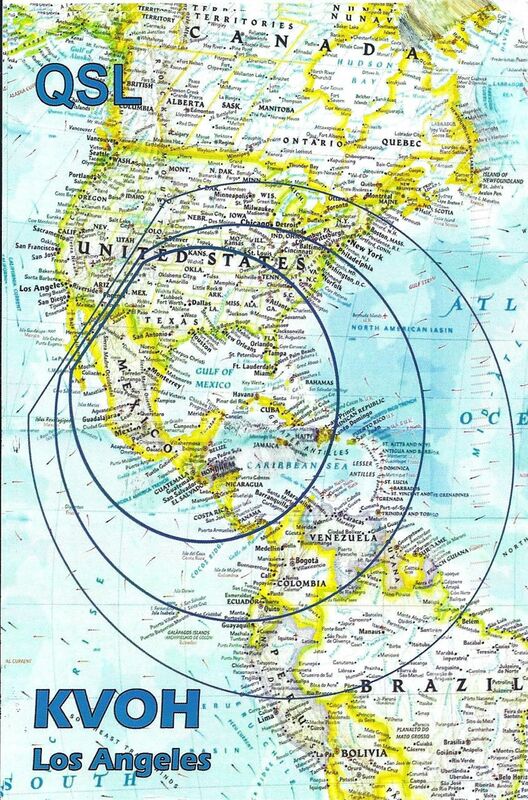 The next entry is dated 1 December 1966, the first day of WWV’s operation from Fort Collins, Colorado. 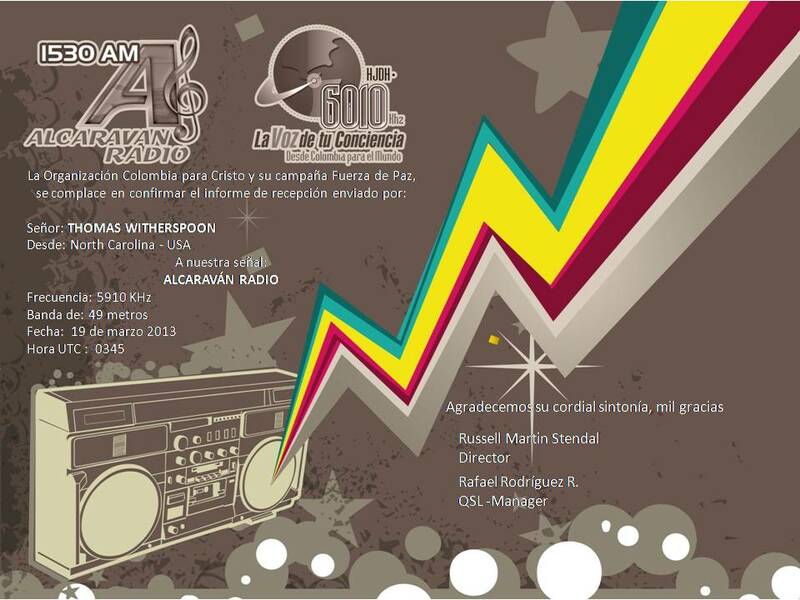 I have one of the special QSL cards issued for confirmation of first-day reception for my report on the 20 and 25 MHz signals [see above]. I’m sure I heard WWVH early on too but my first log entry is dated 29 March 1967. I never did QSL them. Richard: Thanks so much for sharing these special QSL cards. Wow! 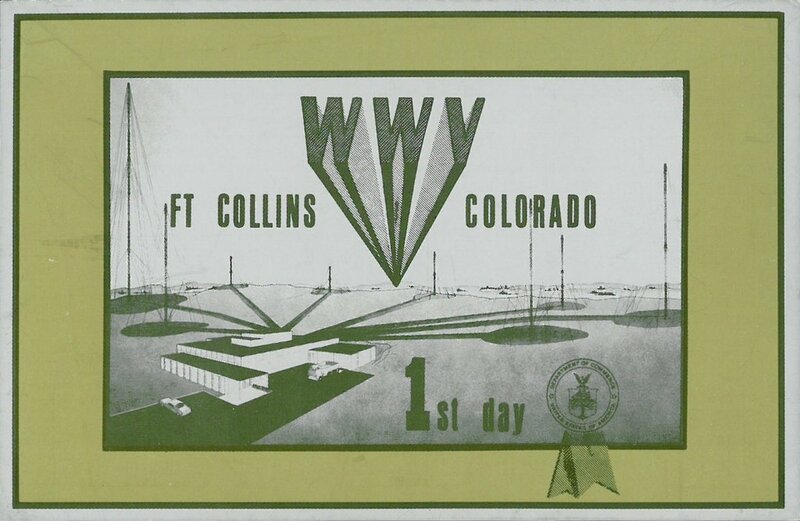 I had never seen the first day card from WWV Fort Collins before–what a treasure you have there! This entry was posted in News, Nostalgia, QSL Gallery, Radio History, Shortwave Radio and tagged QSL Card, QSL Card Gallery, QSL Cards, Richard Langley, WWV, WWV QSL on November 22, 2015 by Thomas. This entry was posted in News, QSL Gallery, Shortwave Radio and tagged KVOH, KVOH QSL, KVOH Test, KVOH Test Transmission, QSL, QSL Card, QSL Gallery on October 20, 2013 by Thomas.